Geoffrey Cox is facing a backlash in Brussels and Dublin after claiming the Irish backstop posed a risk to the human rights of people in Northern Ireland. Mr Varadkar said the EU has already agreed to a review clause and a good faith clause to help Mrs May get her deal over the line. "This problem of a hard border on our island with disruption to trade and our economy, these are problems created in Britain. Surely they are the ones coming forward with further concessions and further offers to us in terms of what more they can do to mitigate the damage they are creating." Meanwhile, the Northern Ireland director of the Confederation of British Industry has warned that business investment is "evaporating" in the North as economic growth grinds to a "near standstill" because of the Brexit stalemate. Angela McGowan said the uncertainty was making the North's economy "more fragile than ever". "No deal would unleash a minefield of consequences on the local economy that cannot be circumvented by mini-deals and last-minute horse-trading. Holding out for unicorns will guarantee no deal. Only backing a deal will take business uncertainty off boiling point," she said. The Chartered Accountants Ulster Society was similarly downbeat, warning the North would be in the "eye of the storm" if the UK leaves the EU without a deal. It said a new industry survey found that just 11 per cent of businesses in the North were Brexit ready and more than half of firms currently have "very little" or "no plans in place to deal with the UK leaving the EU. Big companies from Jaguar Land Rover and Airbus to GlaxoSmithKline have dominated the headlines with their warnings and preparations for Brexit, but the possibility of the UK crashing out of the EU without a deal on 29 March worries smaller firms just as much, if not more. Britain has 5.7m small and medium-sized enterprises, defined as businesses with fewer than 250 employees, and concerns about a potentially disorderly departure from the EU span many sectors. Brexit forced the Manchester-based Elucigene Diagnostics to register its products in Malta this week, including moving a staff member there. This will enable the company, which makes prenatal diagnostic kits for conditions including Down's syndrome and testing kits for cystic fibrosis, to continue selling its products in the EU once the UK leaves. The NHS is also a major customer. "We've been trying to wait and wait and wait, but we had no other choice but to trigger our plans," says Mark Street-Docherty, the chief executive. The additional cost of about £10,000 is manageable for a business with an annual turnover of £4m, but "it's another level of complexity of bringing products into the European market". Brexit should be used to rebuild British manufacturing, according to John Wood, the director of Canatronics, a small business that supplies lighting and timers for industrial buildings. "I just wish the government would stop messing around," says Wood, who voted to leave the EU in the June 2016 referendum. The business is based in the Lancashire town of Chorley, but one of its key suppliers is in Germany. Wood says the strength of his company's commercial relationships will help protect supply links, though the company is ready to use an alternative supplier from China if there are delays. The relatively small parts could be flown over at short notice if needed in the case of a no-deal Brexit. There aren't a lot of fishermen left in this town in North East England, once home to one of the largest fleet of trawlers in Britain. But nostalgia for the fishing industry permeates the place. So the result seemed inevitable when 70 percent of residents voted to leave the European Union. Britain's fishermen have complained for years about regulations imposed on all members. The surprise came later when a local business group began lobbying to avoid tariffs, customs and the other burdens of departing the European Union. Social media scorn ensued. In thousands of tweets across the country, the people of Grimsby were derided as dummies and hypocrites. Either they wanted the upsides of Brexit with none of its costs, or they didn't grasp the harm that leaving would cause until it was too late. "Grimsby residents branded `idiots' for Brexit vote as seafood industry seeks free trade deal," read a headline in a local newspaper. Actually, what happened here is more about hearts than minds. The vote to leave was a vivid demonstration of the way emotions can transform politics and affect the economy. It's a phenomenon found around the world, including in the United States, where the legacy and the romance of a declining industrial past often eclipse the interests of new and expanding businesses. Time and again, economic facts are no competition for sentiment and history. The cod wars were a series of disputes between Britain and Iceland running from the 1950s to the 1970s over the rights to fish in Icelandic waters. Although it was never a war in the conventional sense of the word (the massive and well-equipped Royal Navy would have easily defeated the tiny Icelandic Navy), the peak of the Cod Wars saw thirty seven Royal Navy warships mobilised to protect British trawlers fishing in the disputed territory. While the wars were eventually settled through diplomatic means there was conflict between British naval vessels and Icelandic ships out at sea. The Cod Wars showed how seriously nations took their fishing rights, and the lengths they would go to in order to access rich fishing grounds. In the end Iceland were successful in extending their EEZ massively, and today the 200-mile limit is accepted internationally. Britain's reason for challenging Iceland's ever increasing EEZ was perfectly logical - British trawlers relied on catching cod in the plentiful waters of Iceland, and without this fish many ports built on the fishing industry would struggle. However, Iceland were always going to eventually win international backing to extend their EEZ, and Britain was fighting a losing battle by opposing this. The loss of access to these fisheries devastated many British fishing communities such as Hull and Grimsby and many Scottish ports, with as many as 1,500 fishermen and several thousand shore-based workers from these areas losing their jobs. Come now. The next meaningful vote will do the trick. Lord have mercy. Christ have mercy. &tc &tc. In an unusual change of approach, the EU's chief negotiator Michel Barnier has this evening tweeted details [!] of the EU's latest bid to end the impasse. Mr Barnier said the EU has committed to giving the UK an option of exiting the Single Customs Territory unilaterally, "while the other elements of the backstop must be maintained to avoid a hard border"
"We were and remain happy to apply the backstop to Northern Ireland only if they want to go back to that," he said. "No-deal" BREXIT + NI backstop! A "Special Customs Union"!! Just what Arlene the Paisley and her little dog Sammy ordered! They're going to love it. Just you wait and see. 3/5 EU ready to give legal force to all commitments from January letter of @eucopresident and @JunckerEU through joint interpretative statement. (_link) This will render best endeavour/good faith obligations even more actionable by an arbitration panel. Ash Wednesday marks a significant time for Christians all over the world, as they prepare to celebrate the death and resurrection of Jesus at Easter. May your time of reflection throughout Lent strengthen your faith. Last one's the best one! So the next meaningful vote is on the 14th, the EU Council meets on the 21st and then it is off into the night on the 29th? Now, that I did not know! Why do people think this will work out poorly for May? If her deal is approved, her courage and singleness of purpose will guide the country through the subsequent storm. If there is no deal, her courage and singleness of purpose will guide the country through the subsequent storm. If there is a delay, her courage and singleness of purpose will guide the country through the subsequent storm. Alternatives include BoJo and whoever is in charge of Labour. My understanding is, "people think this" [SELECT BREXIT OPTION] will not work out well for themselves. Unfortunately, the EU only works at the state level - not individuals. Won't his entire department ("Department for Exiting the European Union") be closed down 2 days earlier? Will there be any need for it after that point? I wasn't aware May would be in Grimsby today ... where hatred of the EU meets one of a kind! Sterling fell 0.9 per cent [!] against the single currency to 1.16 and 0.5 per cent [!] against the dollar to $1.30. Now, look here. IF you are watching change in hundredths of of pence to hold on to profit margin, maybe you should be in another business. The Titanic has struck the iceberg, a great shock ... disbelief and the orchestra is still playing, the rich are still having their fun ... only a few know soon it will be all hands on deck ... the empire is sinking and will take a bit of time ... the crew realizes in these cold waters of the North Atlantic there will be no rescue. Theresa May appears set for a second humiliating defeat when she brings her Brexit deal back to parliament next week, after the EU's chief negotiator, Michel Barnier, rebuffed her pleas for last-minute concessions. The prime minister urged MPs to "get it done" and back her deal, in an impassioned speech at a dockside warehouse in the leave-voting town of Grimsby. A vote against the deal would mean "not completing Brexit and getting on with all the other important issues people care about, just yet more months and years arguing", May told MPs. "If we go down that road we might never leave the EU at all." Addressing workers from Ørsted, a Danish energy and wind turbine firm, May also urged the EU to make new concessions over the Irish backstop - the issue that caused many of her MPs to vote against the deal the first time - before last-ditch talks in Brussels this weekend. The EU "has to make a choice too", the prime minister said. "We are both participants in this process. It is in the European interest for the UK to leave with a deal. We are working with them but the decisions that the European Union makes over the next few days will have a big impact on the outcome of the vote. "European leaders tell me they worry that time is running out and that we only have one chance to get it right. My message to them is: now is the moment for us to act." The Unsikable Titanic sinking as only a few can be rescued by too few places in the lifeboats. Contrary to 1912, Brexit wil do no harm to the rich of Great Britain. I don't recall the Titanic sailing intentionally into the iceberg. 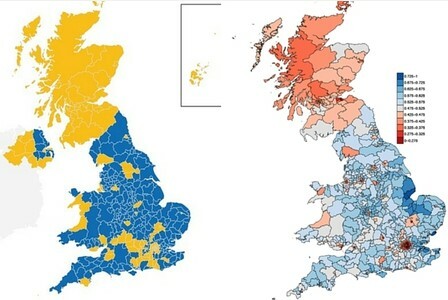 Labour is red / Tories are blue. For the UK and our friends in the EU. In search of quality and integrity in today's politicians .... good luck! on Brexit like no other kind. whose owner was Nigel Farage. although there was so much at stake! I've given up. The country is disintegrating around us, austerity is killing the economy, entire sections of civil society are just about continuing on habit. Yet brexit, the great policy that has kept the country fixated is failing. Everybody knows it's a mess. It is a mess because of Theresa May and her damnable red lines. It is a mess because the leavers forgot the Northern Ireland Agreement and then went into partnership with the DUP, a cyanide capsule disguised as a political party and the tories gulped it down. there is an irony that the DUP's frenzied hard-brexit intransigence is what is most likely to scupper brexit entirely. But even if brexit is foiled due to governmental incmpetence, this will be no return to the status quo ante. The country is desperately damaged and Westminster is entirely too traumatized to be able to do anything about it. Whatever happens, we are in for a very hard time. They say that if there is no brexit then there might be widespread rioting from frustrated brexiters. that may be so, but I think there will be civil disturbances anyway. Over here it is like looking from a tall building, watching a pedestrian cross the street while seeing a truck further up the street speeding out of control towards the intersection. All one can do is watch, horrified, as the inevitable splat looms ever closer. Well, it is like looking at a pedestrian about to get splatted while watching form a tall building that is falling and is itself about to crash into the street. A bit of scare-mongering before another "crucial" vote ... or just a repeat of earlier announcements? A report released by a London think tank on Monday said that 275 financial firms are in the process of transferring a combined $1.2 trillion (1.06 trillion) worth of funds, assets and staff from Britain to the EU. The "Brexitometer," published by the New Financial think tank, said that the moves are an "inevitable consequence" of the "political circumstances" surrounding Brexit. Although the City of London's dominant position as a global financial center remains intact, the report highlights that Brexit has forced financial firms to prepare for whatever regulatory environment will emerge between the EU and Britain as Brexit negotiations continue. The independent think tank said half of the affected asset management firms, such as Goldman Sachs Investment Management, Morgan Stanley Investment Management and Vanguard, had chosen Dublin, with Luxembourg the next port of call, attracting firms like Schroders, JP Morgan Wealth Management and Aviva Investors. Nearly 90 percent of all firms moving to Frankfurt are banks, while two-thirds of those going to Amsterdam are trading platforms or brokers. Paris is carving out a niche for markets and trading operations of banks and attracting a broad spread of firms. New Financial identified 5,000 expected staff moves or local hires, a figure that is expected to rise in coming years. A better measure of Brexit's impact is the scale of assets and funds being transferred, it said. ○ Brexit means London's financial star is falling. Which of its rivals is best placed to rise? | The Independent ! I crossed this bridge daily on my stay in Millwall, London. On and near this bridge were a number of homeless persons/beggars. Even on the coldest day of winter weather ... The flight of Westminster conservatives from EU regulations. European Council President Donald Tusk says the EU is "disappointed" by tonight's Brexit result -- and that it has done "all that is possible to reach an agreement" with the UK. "Given the additional assurances provided by the EU in December, January and yesterday, it is difficult to see what more we can do. If there is a solution to the current impasse it can only be found in London," Tusk said in a statement, supplied by his spokesman. "With only 17 days left to 29 March, today's vote has significantly increased the likelihood of a 'no-deal' Brexit. We will continue our no-deal preparations and ensure that we will be ready if such a scenario arises." wow. those 10 DUP votes really made the difference.